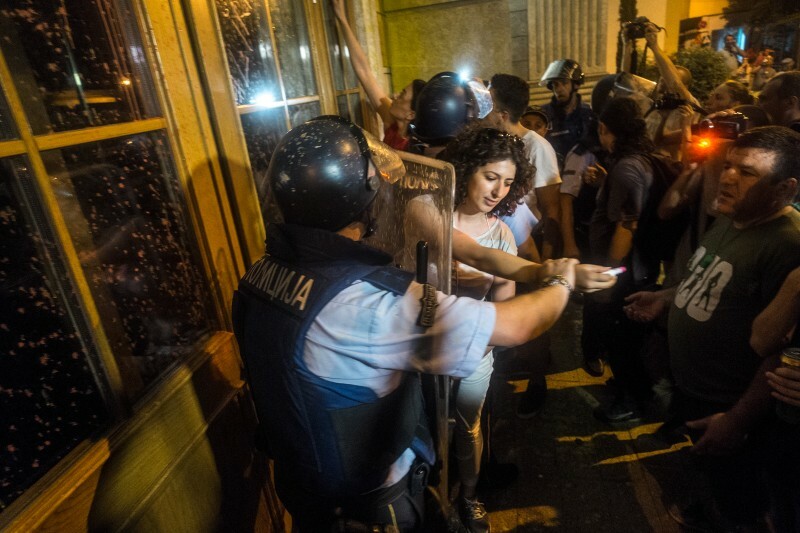 “Special police forces successfully rescue the Ministry of Finance from a dangerous girl carrying lipstick.” Photo by Vančo Džambaski, CC BY-NC-SA. Demonstrators in Macedonia's so-called “Colorful Revolution” have rejected the government's bid to increase the country's foreign debt, spurring further protests. 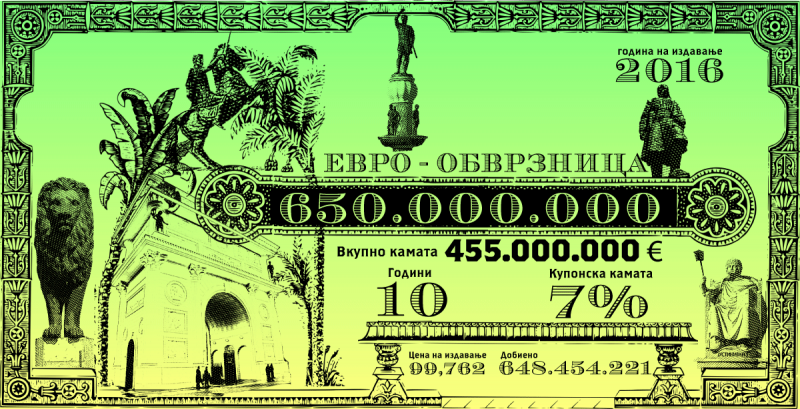 In early July, the Macedonian government announced plans to issue a new Eurobond in the amount of 650 million euros ($720 million), claiming that the move would boost investment. Representatives of the opposition party SDSM as well as the movement known as the “Colorful Revolution” are criticizing the plan, saying that the loaned money will be wasted on corruption as long as the current government remains in power. Нема правда кога јавниот долг вртоглаво расте. Секој граѓанин на Македонија веќе должи по 2200 евра, а режимот сака да го задолжи за уште 330 евра, во очајнички обид да продолжи да владее криминално. Нема да дозволиме! Не прифаќаме државата и граѓаните да тонат во долгови! Не ги признаваме долговите на расипниците! Protest! There is no justice when the public debt keeps doubling. Every citizen in Macedonia already owes 2.20 euros [$2.40], and the regime wants to put everyone in more debt—another 330 euros [$365]. This is another desperate attempt by this criminal government to keep ruling this country. We will not allow it! We will not allow the country and its citizens to be drowned by more debt! We do not recognize the debts of these people who squandered the state's money! A Eurobond is a special kind of foreign debt that a government issues to “investors,” meaning creditors. The creditors are entitled to receive the full amount of the loan at a given date, and in the meantime they collect interest payments. The interest-included total cost of Macedonia's new 10-year Eurobond is estimated to 1.1 billion euros ($1.22 billion). A meme from a Facebook album informing the public about the amount and obligations of all the Eurobond issued by Macedonian government. Source: Facebook page “Javen dolg” (Public Debt). Used with permission. On social media, Internet users have shared memes based on statements like “not in my name,” warning potential creditors that they and their children will not honor the debt incurred by party boss Nikola Gruevski's government. 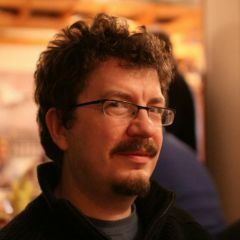 An online petition on Change.org, declaring “As a responsible citizen, I don't recognize this debt and renounce any obligation to return it,” had attracted more than 3,100 signatures at the time of this writing. “1.1 Billion Reasons for the End” banner at a “Colorful-Revolution” protest on June 11, 2016. Photo: F. Stojanovski CC BY. Police guarding a passage under a building in Skopje. Photo by Vančo Džambaski, CC BY-NC-SA. The whole area was under virtual siege, with tenants in some of the buildings forbidden to enter or leave their own homes. Police officers didn't explain or try to justify their decision to place limits on locals’ freedom of movement. Overnight, protesters refused to disperse, despite efforts by the police to end the demonstration, and demonstrators ultimately managed to break through the police cordon. 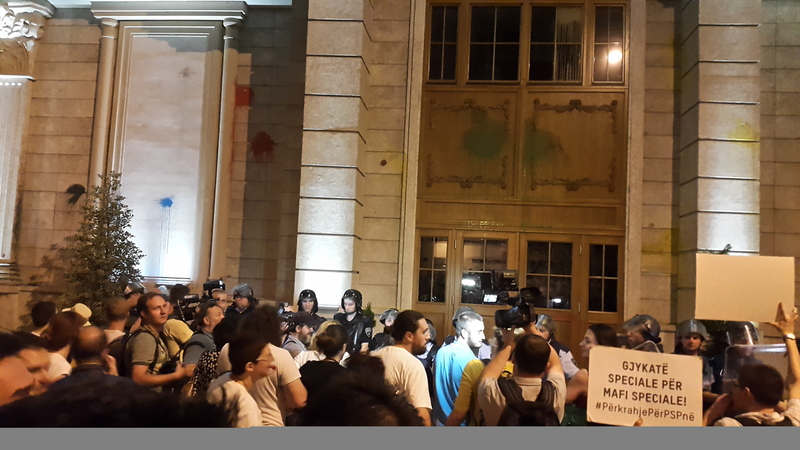 Officers then withdrew and allowed protesters to approach the perimeter of the Ministry of Finance. Outside the Finance Ministry building, activists met a group of their compatriots who had managed to circumvent the police blockade by passing through garages, This group had been surrounded by police, staging a sit-in. When both groups fused, chanting and singing songs (including Macedonia's national anthem), together they painted an exposed wall of the Ministry of Finance. “A special court for a special Mafia!” read a sign in front of Ministry of Finance in Skopje. Photo: F. Stojanovski, CC BY. After the protest, many of the participants commented that there was some confusion among the police. 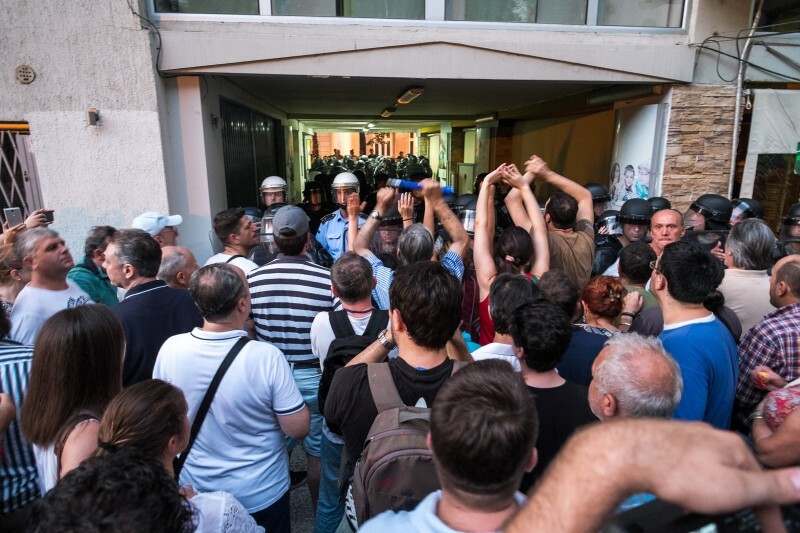 For instance, even after the blockade was dismantled, a police squad continued to “defend” a corridor within a building, refusing to let protesters pass. Public debt is something of a taboo topic in Macedonia. As the government has struggled to maintain economic growth over the past decade, the country has increasingly relied on foreign loans to finance its state bureaucracy. Critics complain that subsidies ensure the current government's electoral success by promoting the loyalty of key voting blocks. 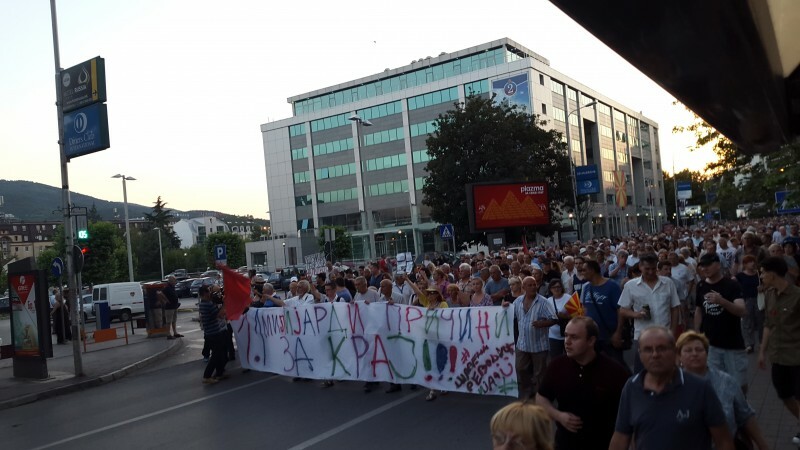 Anti-corruption NGOs also claim that much of Macedonia's public spending is laundered and stolen, including the inflated expenses for large taxpayer-funded projects like Skopje 2014, which costs an minimum estimated 640 million euros ($708 million). According to the investigative journalist Xhelal Neziri, at least 5 billion dollars (4.5 billion euros) have been taken out of the country thanks to corruption during the last decade.